wow! 16 background colors and a total of 14 fonts??? Way to innovate YouTube, GOOD JOB! One reason they 'interupt' is because they take you away from the video completely. There should be annotation options that pause the video, and open the link in a new window so it becomes so much easier to return to the video you left. A small indicator to indicate the link will open in a new window or not. I would click on sooooooo many more annotations knowing I could easily get back to where I started. Yes, we need annotations to open in a new tab. That would be great! Thank you for annotation improvement! A new annotation type should be polygon annotations. Users would be able to draw straight line shapes. For example, if a user wants to put an annotation over a picture frame, tv screen, etc., they could draw a box to fit the frame, screen, etc. Current rectangular annotations does not allow this. I've been playing with this editor since it released and I've noticed it's not saving links when you add them unless you change the start time of the link as well. That is an annoying bug when there are multiple annotations that you have added to a video which you thought had all the links (which took time to go and find) but turned out they didn't save as links. I have also reported this bug through the regular bug reporting channels, but figured the more I talked about it the sooner it might get dealt with. What about the SAVE FUNCTION we've been asking about? 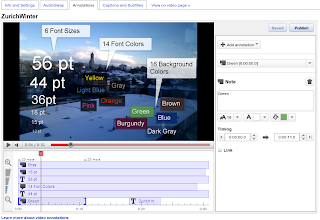 So many users waste so much time adding the same annotation to every video. My videos rely on the "share annotation" link in order to provide my viewers a means to add their own funny annotations to the video. I'm not the only one that does this. Please, please add the link back! What M3gabyt3 said. Annotations would be 300x better if they opened links in new tabs. It is so annoying when I'm watching a video and go to pause it to find the person who made the video put a full screen annotation. Very annoying. Beautiful job Youtube. I enjoy the font sizes and color options, but I REALLY enjoy having the interface / annotation list in the external box / controls. Huge deal! Thank you so much! I can't do invisible annotation anymore. Why? Bring back this option, please! I only have 3 font sizes. The announcement says there are 6. "Finally we’re discontinuing the Collaborative Annotations feature to make room for even more new features coming soon." How is it possible to be this inane? Youtube, BRING BACK CALLABORATIVE ANNOTATIONS OR ELSE I WILL QUIT!!!! I have gotten to play with the new annotation system quite a lot recently, and there are a few things I'd like to see happen in the next round of upgrades. BTW, before I move on, thanks for fixing the annotation link bug that I mentioned earlier. Anyway, one thing that you took away in this new system is the ability to simply click in the video pane where we want the annotation to go, which would also pause the video at that point. I don't really see a reason that this feature got discontinued aside from moving EVERYTHING outside the video pane (which I like actually) I think this system is less accurate in timing our annotations (which can be VERY important to some users) and I'd like to see that functionality restored. I would like to see the "pause when annotation is clicked and open said annotation in a new window/tab" feature be an OPTION for those of use who are creating the annotations. Or, barring that option (pop-up blockers might get in the way there) could there be a link at the top (or bottom) of the video which was linked in the annotation that would link BACK to the video which linked it. Does that make any sense? Say I link a video in an annotation that occurs in my video from 0:05-0:10 and the user clicks on the annotation, it takes them to the video annotated and they wish to return to the previous video. The link would link back to my video at the point at which the annotation first appears--in this example it would go back to 0:05. It would also be nice to have a streamlined system for adding "Back" and "forward" buttons to our videos, as it stands we have to have at least two windows open in order to add annotations that lead to our own videos, and that just seems like a waste of resources. If there could be a drop-down menu that contained the names (and subsequently the urls) of our videos that would make things MUCH more streamlined and add a good splash of awesomesauce to an already great feature. "Finally we’re discontinuing the Collaborative Annotations feature to make room for even more new features coming soon." Typical YouTube, telling people what they should want instead of asking people what they'd like. Arrogance to a level never thought possible. Please don't discontinue collaborative annotations. Some of my favorite videos rely on them for their creation? It'd be pretty sucky if no more of them could be made. One, you should bring back adding annotations while watching the video and two, the annotations are messed up on my videos, I mean, I'm using the spotlight annotation and the box that I put text in is fine in the editor, but once I save, publish, and look at the video page, it moves! Youtube! What are you doing in my store? Get out! and fix the annotations!